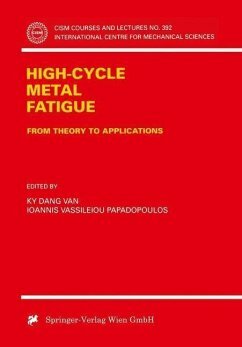 This book is devoted to the high-cycle fatigue behaviour of metal components, thus covering essential needs of current industrial design. The new developments included in the book rely on the use of the mesoscopic scale approach in metal fatigue and allow the specific handling of such difficult fatigue problems as multiaxial, non-proportional loading conditions. P. Davoli, Principles of Current Methodologies in High-Cycle Fatigue Design of Metallic Structures.- K. Dang Van, Introduction to Fatigue Analysis in Mechanical Design by the Multiscale Approach.- I. V. Papadopoulos, Multiaxial Fatigue Limit Criterion of Metals: a Mesoscopic Scale Approach.- A. Bignonnet, Fatigue Design in Automotive Industry.- H. Maitournam, Finite Elements Applications: Numerical Tools and Specific Fatigue Problems.- V. P. Panoskaltsis, Gradient Dependent Fatigue Limit Criterion.